So, I am not a technologist, but I wish I was. I appreciate technology. To think about the creativity and logic that goes into creating a new application or piece of hardware blows me away. I don’t understand the hardware side as much, but I love the user experience side. This likely explains why I am a huge Apple fan – but who knows, maybe my interest in Apple lead to my appreciation. I’ve been an Apple fan since high school yearbook in the early 2000s when I worked closely with the color iMac. So I am posting this because I woke up early to pre-order the Apple Watch 2. I know it’s crazy, but that hype always gets me going. I woke up to pre-order my rose gold iPhone 6s, Kate and Will’s wedding, and I prefer early morning flights. Oh well. I don’t think they will sell out of the Watch 2, but I’ve been waiting for the second edition since the first one was released a year and a half ago. Even though I’ve been waiting for a long time, I don’t make them lightly. I made my (probably) fifth visit to the Apple store this evening to confirm the color and size watch I wanted. My iPad purchase was equally bad; at least I had 1.5 years to think about it. I don’t take decisions likely. My final decision. Such a hard decision, but I decided the silver 38 mm sport version with a white band will be the most versatile. how many people had it to share information, but it wasn’t as reliable as the UP Band. A year ago, my Fitbit stopped charging, and I couldn’t fix it. 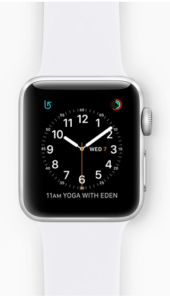 My cheap, stubborn self decided to wait for the Apple Watch – and viola! Here we are! These are my main reasons I can’t wait! I want a running watch. I feel the Apple Watch 2 (with GPS) is even better than a running watch because you can wear it all the time and do lots of things. I’m not good at texting and paying attention to my phone (only millennial with this problem), but I hope I’ll be more alert to messages and action items. Geeking out my house – one of my big projects I’m researching is figuring out how to make my house “smarter.” I’ll share my findings in my blog, but the watch is another option for controlling the house. Get ready! I’ll let you know how I like it starting next Friday (September 16). In the meantime, all Apple users, mark your calendar for Tuesday, September 13, to download the free upgrade to iOS 10. If you enjoy texting, you’ll love its enhancements. Another meal box down, and funny enough, this was the first box I had ever heard about. I love the TV show Shark Tank. If you don’t know what it is, please research it and watch a few episodes. The show has been on for several years, and I think has done a lot to promote entrepreneurialism and the American dream. I love this show and what is represents. 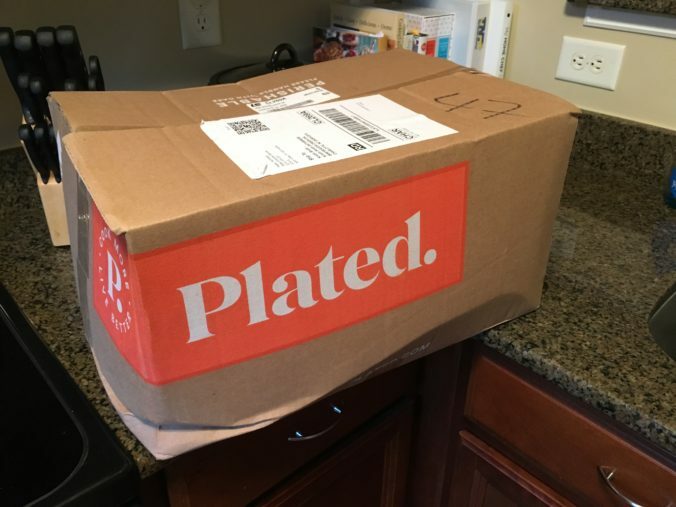 Anyway, the first time I heard about meal subscription boxes was when Plated was pitched on Season 5 (early 2014). I thought it sounded really cool, but sure enough, a lot of competitors have come up since their invention. Since Plated is what got me interested in these boxes, I couldn’t wait to try it. 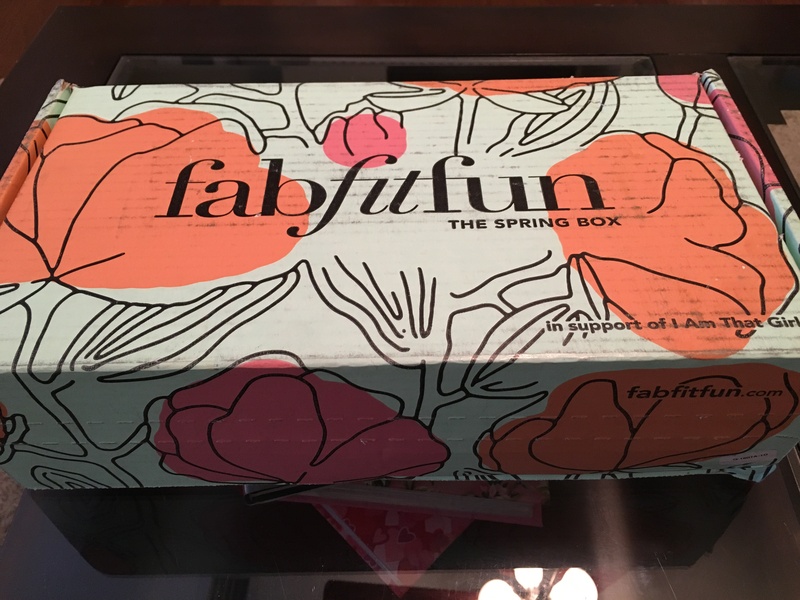 Unfortunately, this is also a very expensive box, so I prioritized other brands who also had a bigger, first box discount. Plated meals cost $12/person. A box for two people with three meals costs $72/week, which I think is a bit pricey. Their initial offer is two free meals per week. The website is very easy to use and meals are posted 5 weeks in advance, which is very friendly if you plan on using this service regularly. The overall brand and pictures are also the more “trendy” compared to competitors. It makes the company look cool and friendly. I ended up buying two weeks of boxes since the recipes seemed interesting. The first box I received was a bit damaged, but all of the food was included. It made me nervous since it’s hot here in NC and the food needs to stay cold. Luckily, it was okay. I made 6 meals in total. Some were really good, some I wasn’t a fan of. 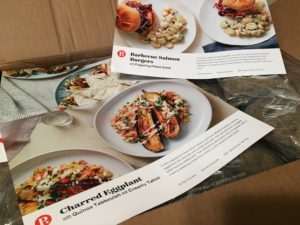 This is probably the first box I ordered that there were recipes I truly didn’t enjoy, but there were some I liked a lot. The ingredients were also very fresh and seemed of high quality. The Barbecue Salmon Burgers were one of the best dishes I made as part of this experiment. They were easy to make and very delicious. I am also not a fan of potato salad, but this was made with Chobani yogurt, mustard, lemon, and olive oil. It was so good, and I hope to make this again soon. My other two favorites were the pizza and charred eggplant. The pizza was easy enough to make on your own. I never thought to use those ingredients on a pizza, but it was really good. This was the first time I ever made eggplant. I think eggplant is the funniest looking vegetable; there is no way you can look at it and not laugh. This was also my first time eating and making quinoa. Overall, I really enjoyed this dish. I liked it even more as leftovers. It was also incredibly simple to make after you cut up everything. This was the first time I ever made eggplant. I think eggplant is the funniest looking vegetable; there is no way you can look at it and not laugh. This was also my first time eating and making quinoa. Overall, I really enjoyed this dish. I liked it even more as leftovers. It was also incredibly simple to make after you cut up everything. 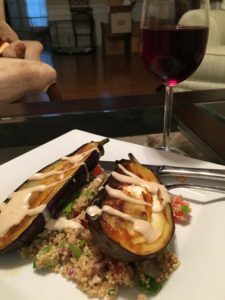 All you have to do is make the quinoa, cut the eggplant and put it in the oven with salt and cayenne pepper (I used too much for me). Then you make the tahini dressing and viola! dinner. The other dishes weren’t my favorites. 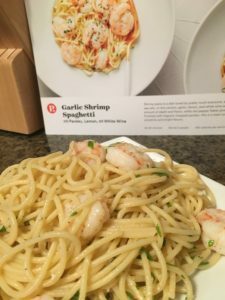 I was sad about the Garlic Shrimp Spaghetti because I’ve made similar dishes in the past, but this one lacked flavor. Something about the sauce wasn’t rich enough for such a basic dish. Overall, Plated was fun. I love Plated’s brand. I think it does a lot to sell the company and make it cool. However, if I was to choose a meal subscription box to use regularly, I wouldn’t choose Plated. The price point is out of my budget, and many of the meals weren’t my favorite. If I ate pork/beef, it may be better since the salmon burgers were delicious. I also like how they engaged on social media. They would like and comment on my Instagram posts about their meals. I think that goes into the brand and being “cool.” Nice touch! 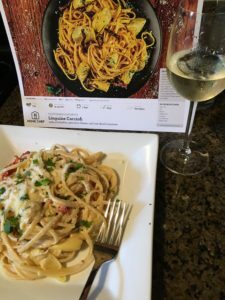 I’ve really enjoyed receiving and trying meal subscription boxes. Going to the grocery store is overwhelming and trying to pick a meal in addition to the shopping…well, it’s just a bit much for me. Next, it was time for me to try Home Chef. Home Chef is intriguing because there was a much larger selection of meals (9 compared to 5 or 6 in other boxes). The minimum number of meals you can order is 3 meals for 2 people, but you can order up to 5 choices each week (first time I’ve seen this). There is also an option for fruit and dessert add ons. 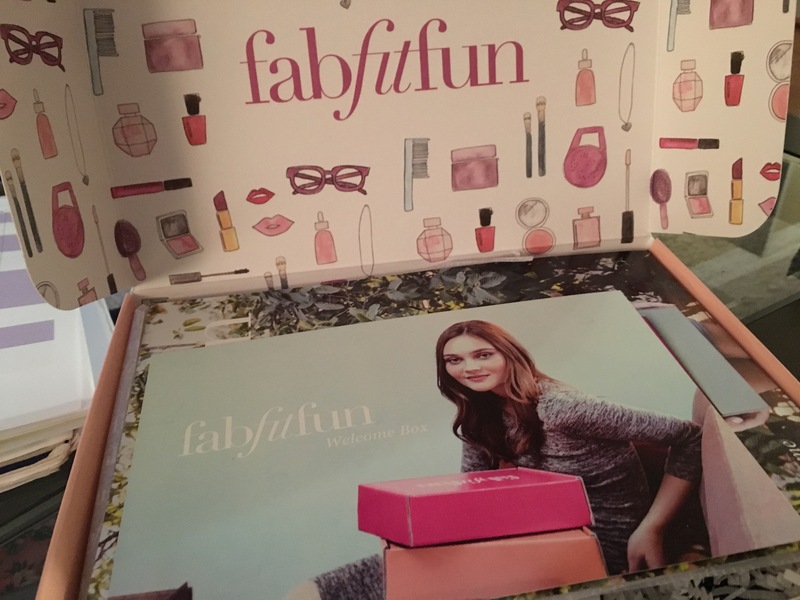 Because of their marketing deal, I actually did two boxes ($20 off the first box, $10 off the second)…then did a third for fun. 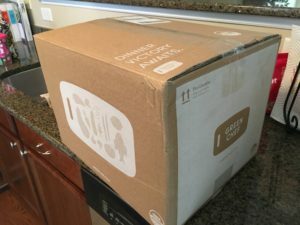 Home Chef sends all of the food in an insulated box. Each meal comes in its own bag, with the protein packaged separately. It is very important to store the chicken on a plate in your fridge! Mine leaked in the fridge which caused quite a problem and took a while to clean. In your first box, you will receive a binder so you can make your own cookbook of Home Chef recipes. I thought that was a clever idea. I have accumulated quite a few recipe cards, so this was perfect to store all of them together. The ones from Home Chef come pre-punched, as well. Just add it and go. I decided I really like when the ingredients for each meal are packaged together. It makes it easier to cook when you’re ready, and you don’t have to worry about losing something. The produce was relatively fresh. It wasn’t what I would have picked out in the store, but it was okay and it lasted for several days. 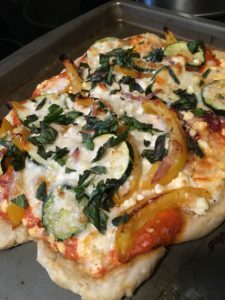 I love meals that start with a lot of color – especially PIZZA! 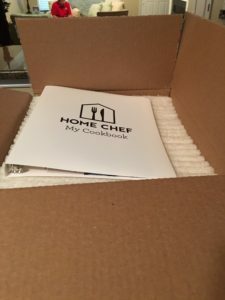 This is how Home Chef packages their meals. Almost everything is in a bag with a recipe label. Larger ingredients and protein are separate. Instead of boring you with all of the details of each dish, I’ll give you my highlights. 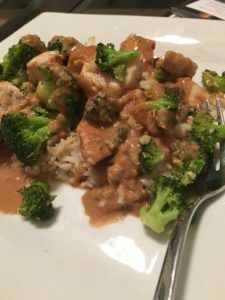 Chicken with Garlic Peanut Sauce was delicious and something I think I will make all of the time. It was easy and so good. The sauce is just 2.3 oz of peanut butter, 1 TBSP. rice vinegar, 4 TBSP. of water, and 1 TBSP. soy sauce whisked together. You can put this on chicken, rice, broccoli, and viola! Yumminess. It also recommends 1TBSP. 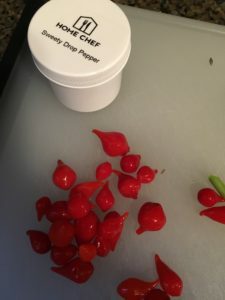 of Chili Garlic Sauce, but I didn’t use it because I don’t like spicy food. 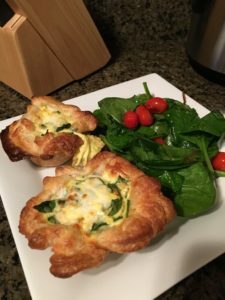 The spinach salad from the quiche dish was also easy and healthy. Basically, you put 2 tsp. olive oil over medium-high heat on the stove and add shallots and grape tomatoes. You cook them for 4 minutes. During that time the shallots will caramelize and the tomatoes “blister” and start to burst. Season with a little salt and pepper, then throw into a bowl with the spinach. Once you mix it around, it will start to wilt a little bit. That’s your dressing. 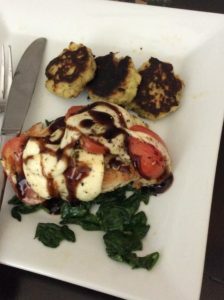 The entire meal for Margherita Chicken Breast with Parmesan-cauliflower fritters was delicious. 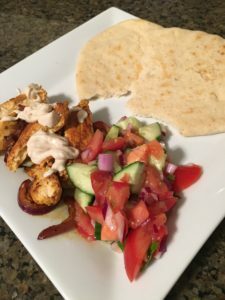 I had never cooked cauliflower before, but it was easy (big theme with me!) and quite good. They also warmed up well for leftovers. Home Chef seems to be the most “normal” option. 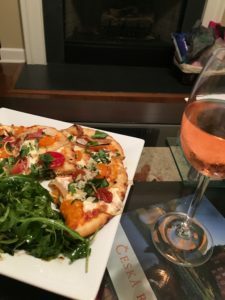 Because you have so many more options to choose from, it seems like it could be your best choice for a weekly service (if you’re a picky eater, like me). What I don’t like about it is I would choose these recipes from a cookbook. 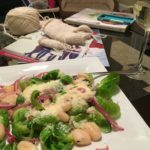 Nothing about these meals was unusual or made me get out of my comfort zone. 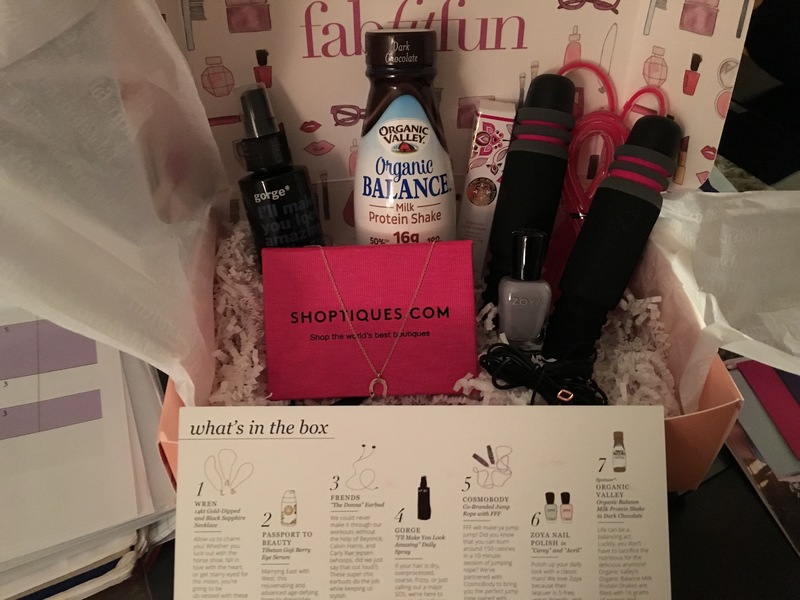 That is what I’ve liked about some of the other boxes – I have tried food and flavors I normally would not have tried. Even though their price is more affordable, I think you could buy ingredients for some of these meals chapter than $10/meal since the dishes are so simple. 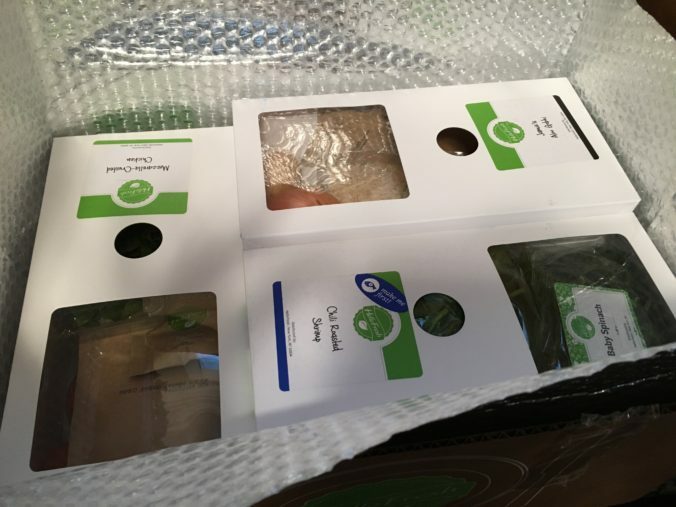 Green Chef is another meal subscription service, but with an organic twist. Like other services it provides 3 meals/week for 2 people. 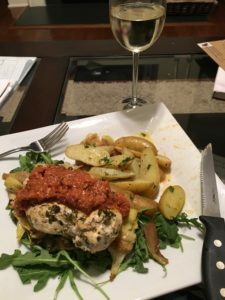 The price is a bit more expensive, but definitely some of the best meals I’ve made. You can order based on your diet (vegetarian, omnivore, carnivore, Paleo, and gluten free). This diet will affect the price of the box. The vegetarian is the cheapest at $62/box and Paleo is most expensive at $90/box. First time buyers can get 2 free meals. This has been my favorite packaging by far because it’s color-coded. Who can’t love that?! Blue Apron was a box of ingredients and you had to determine which one went with which recipe. Green Chef had all of the ingredients in one box, but they each had a color label on them (goldenrod, red, orange), which matched the recipe card it was for. Such a better way to organize it. All of their packaging is also recyclable. You had to read on the website how to recycle each part, but it was good to see their recognized how wasteful this could be if you received a box every week. They also pre-made sauces and some ingredients, so they had numerous small, plastic jars. I saved some of these to use in my lunches later. All of these were very delicious and made for good leftovers. My biggest complaint is that I enjoyed these recipes but couldn’t make them again because the sauces were already made. 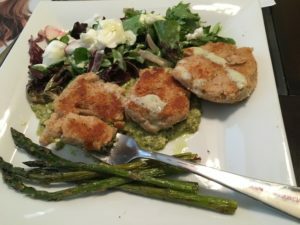 For example, the White Bean Cakes came with white bean puree (not sure if this is something I could make or if you need to buy it) and “mint-pea pesto.” Not sure what was included in these and what would be needed to make them. The instructions were easy to understand, but I should have made the hard-boiled eggs the way I normally would (bring to a boil for 1 minute, then simmer covered for 13 minutes). This suggested it site for 12 minutes, but it wasn’t cooked enough for me. Finally, the last meal I made was Greek Chicken & Potatoes, and it was my favorite of the three. There is something I like about a side of potatoes. This was the first time I made fingerling potatoes, which were delicious. 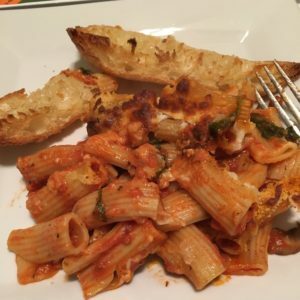 I was surprised I liked this recipe because it included canned artichoke hearts. I love steamed or boiled artichokes, but I’m not a big fan of them when they are canned. Too salty or something for me. This dish had a great blend of flavors; the arugula is what brought it all together. 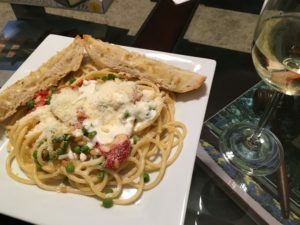 I wish I could make this again, but the creamy sun-dried tomato sauce was pre-made. It says it included feta cheese and sun-dried tomatoes, but I’m not sure what I means. A nice step that can by used when cooking in the future is the marinate for the chicken. I let it sit for 2 hours, but it says it could marinate for 5 minutes. It was only lemon juice, olive oil, parsley, cilantro, and marjoram. How easy and good. Then it gets cooked on the pan. If you have this option in Green Chef – I highly recommend it. I can appreciate organic, but I am not an organic eater and cannot appreciate an increased cost for eating in this manner. 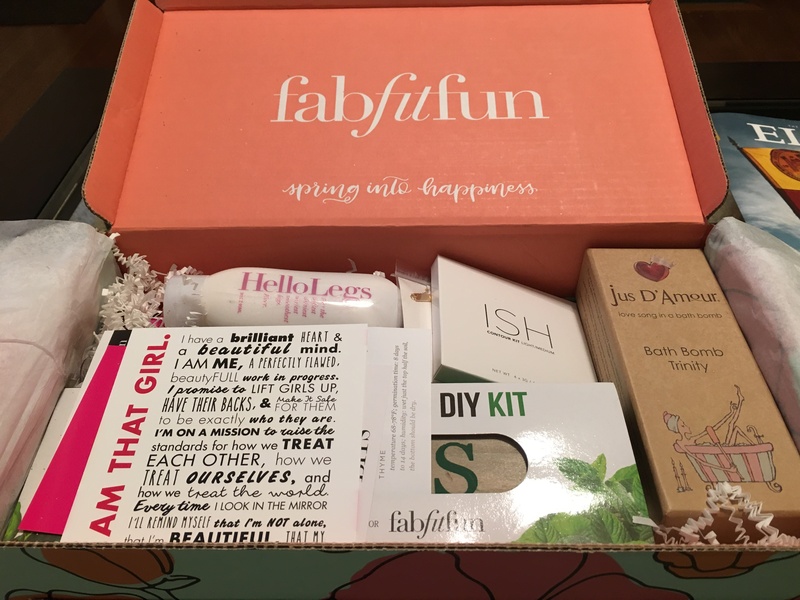 This box is about $20/week more expensive than other boxes. I didn’t see a quality different in the produce or protein, so I wouldn’t buy this box again. The food was delicious, but in the competitive world of subscription boxes, this doesn’t have enough compelling features to sway me into the Green Chef camp. instructions basically say the kit is flawless. Nope. Not for me. No sprouts, and I don’t know why. I’ve given it several weeks, but I think I need to find new seeds to plant. I really like the box they provided, and it fits perfectly on my window sill. I would have used this already, but I have to Google it. I understand the concept, but I am not sure how to apply it. No feedback yet for this until I stop being lazy to figure out the right way to use it – I don’t want to look like a clown. Keratin Gloves and Socks: The brand is Bodipure, and they worked really well. They are essentially cheap plastic cooking gloves (and socks) that are filled with lotion and oil to soften hands. I did an at-home mani/pedi, and it worked much better than soaking and using oil. You can buy them on Amazon for $5.99/pack and in bulk on their website. I will likely buy these again since they worked well and are made from all-natural products. HelloLegs shaving cream: They softened my legs a bit, but for the most part, I didn’t see a big difference in this. I may just need to use it longer and more often to see more of a result. Marrakesh hair oil: This smells great, but I haven’t used it enough yet. It doesn’t “spread” easily, so I don’t know if I am applying it correctly. Jus D’Amour Bath Bomb: Haven’t had a chance to take a bath yet, but these smell so good, I can’t wait to take one soon! Jewelry piece by Jook & Nona: as I mentioned before, I’m not a big jewelry person, so I don’t get into this much. It’s a nice necklace that says “love” but completely not my style. Yoga Mat Strap by Merrithew: Because my herbs haven’t grown, this was my favorite item. I’ve been wanting one of these for a while. 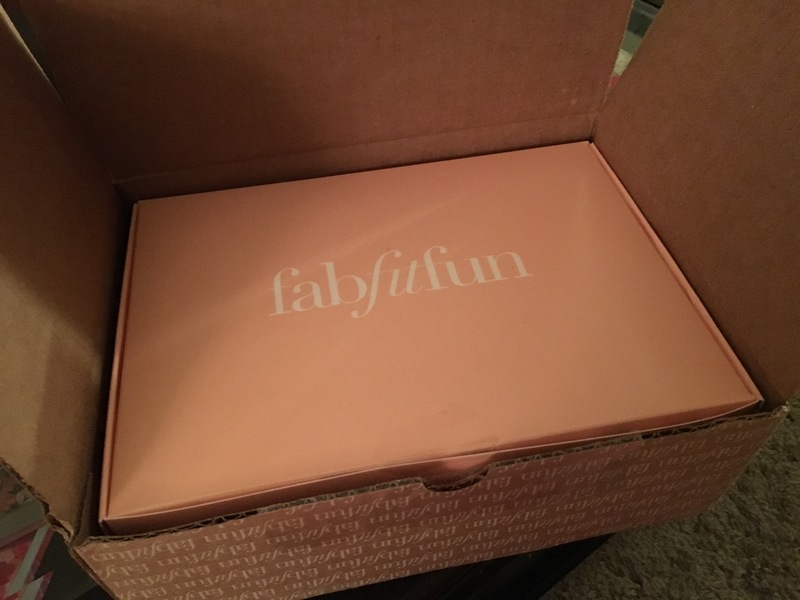 You can buy a gray one on their website, but the FabFitFun edition was pink, my favorite color. It doubles as a stretching assistant and works fantastically! They are having a sale until May 31, 2016, for 25% off their website with code FFFMAT16. I’d say that’s a great deal! I am that Girl partnership: they partnered with the nonprofit to promote their message – very good message, so here’s a call out to the organization. Well, that’s all for these season. I look forward to receiving the next box. I’ll post in a more timely manner in the future. 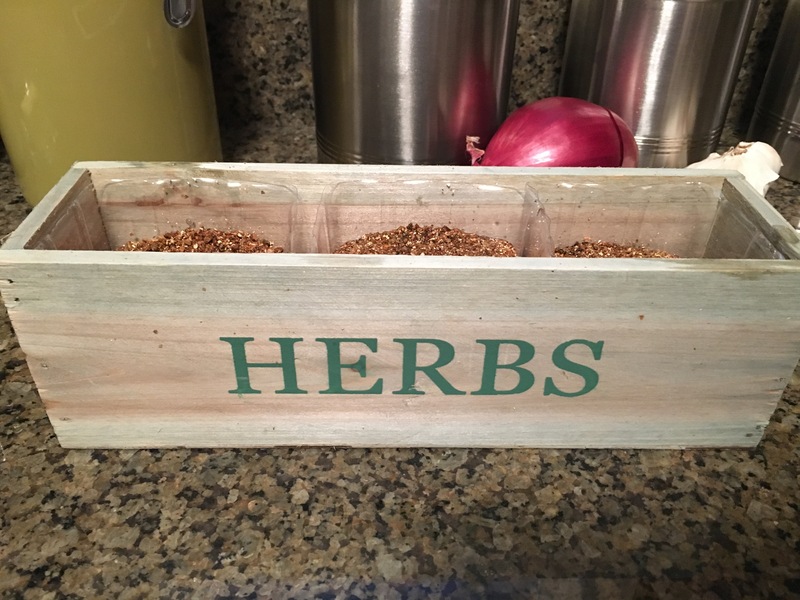 It takes a while to try these products…and I was REALLY hoping I could share a picture of my herbs. But, alas, they will be laid to rest this weekend. 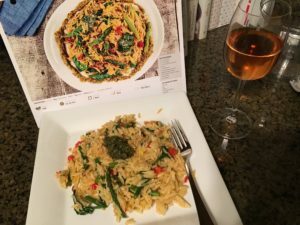 Well, I FINALLY got around to posting about my Blue Apron meals; I can’t believe how far behind I am. One of the things I am most excited about it I get to compare companies. Compared to Hello Fresh, Blue Apron couldn’t be more different. Everything from the meals to the packaging – they are night and day. This box is 3 meals/week for 2 people – $59.94, which is slightly less expensive. The website was relatively easy to use and, if you’re a regular user, an app to help schedule your deliveries. I also felt it gave more information about how the program worked; I didn’t have any questions like I did before. Not too much to say here. The delivery was on time and seemed packaged well. In addition to the delivery, an email was sent notifying you about your delivery. It also had a link for tips and videos on how to cook your meals that week. That was cool help. The packaging was also very different. 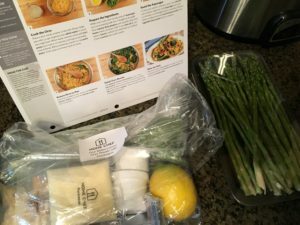 With Hello Fresh, they had a box for each meal’s ingredients. 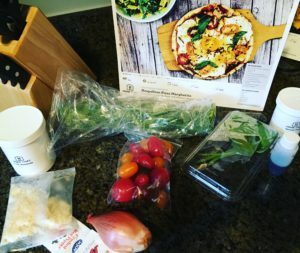 Blue Apron – all ingredients in one big box. No distinction for which item goes to which meal. This was probably my least favorite aspect of the service. I wasn’t a fan of the Adobo-Style Chicken, but that didn’t surprise me. It was too spicy for me, but I ate it all. Now, the other two dishes…WOW. I could not believe that I liked the salmon dish. It wasn’t hard to make but it turned out amazingly. The “hash” was purple potatoes (didn’t know they existed) and red onion. Sounds like a horrible combination – then you make the pesto with spinach and capers – YUCK! But in reality…YUM. I would never have ordered that as a restaurant. Now I can’t wait to make it again. The gnocchi dish was good, but I would have liked more gnocchi in it. I think I had too many red onions. I do really like Brussel sprouts. It was my first time cooking them, and easier than I thought. That was an intimidating food, but I conquered it. 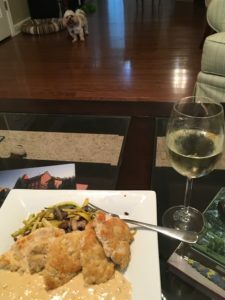 Blue Apron was great! 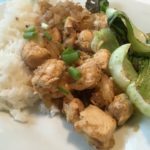 More affordable than Hello Fresh and exposes you to unusual foods to make unique meals. It’s easy to order and easy to do. Somehow, I messed up each of the meals at one step or another, but it was all still delicious. So, apparently I didn’t cancel my Hello Fresh subscription in time so I received another box over the weekend. I was slightly annoyed because I didn’t want another box. With the applied credit of $23 from the last box’s missing ingredients, the total cost was $46. A little pricy (since I am getting a shipment from Blue Apron on Wednesday), but a more reasonable price in my book. Just looks like I’m going to have A LOT of cooking to do. The box was much better on this delivery than on the first. I don’t know if my first box was missing more than just the chicken/shrimp or if Hello Fresh made improvements since my first order. There was an instruction book that told you more about their tips for ingredients and what you may need to have in your house to compliment their recipes. They also had advertisements for other snack programs, which is similar to a company I am obsessed with – Graze.com. Not sure if I’ll try these out, but a clever avenue to advertise their product. Chicken and shrimp were also included in this box, which is a plus. Overall, a much, much better impression. 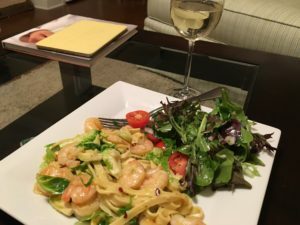 When I moved to Charlotte, I wanted to try all of the food-cooking, delivery services (is there a real name to these)? First up is Hello Fresh. I had a $40 off coupon to use, so the original $69 price tag was reduced to $29, which includes shipping. This costs covers 3 meals for 2 people. 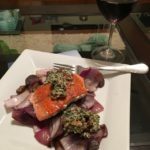 The website is relatively easy to use, but I did find it confusing to learn FAQ section and how to pick the meals I wanted. Since I’m a picky eater, this is important to me. I emailed the team and received a quick response back in how to do this. I love to get mail, so the delivery was really fun. 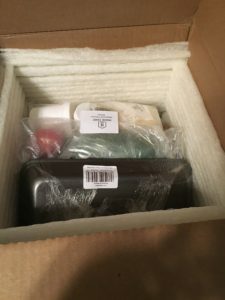 I received a huge box and in it where there separate meal boxes. It also included a recipe book for all of these meals. Unfortunately, the box was missing the protein items (chicken and shrimp) for two of the meals. Customer Service (I used email) was very prompt and helpful. I told them I was missing these two items and they put a $23 credit on my account. I felt like it should have been something more since I now had to go to the store to buy shrimp and chicken. I was pleased with how quickly they responded. These were interesting because I wouldn’t have chosen to make these if I was looking in a cookbook. Overall, all of the recipes were really delicious. It was fun to cook dinner, and they came out well. The Aloo Gobhi was supposed to take 45 minutes, but it ended up taking me closer to 1.5 hours. I may not have cooked it on high enough heat. I am also slow when it comes to chopping vegetables and this took quite a lot of chopping. I usually don’t cook a lot because it makes too much food, but this was only two portions. It made for a great lunch the next day. I was nervous it would be too spicy (I don’t like spicy), but it wasn’t. It was surprisingly delicious. The Chile-Roasted Shrimp was really delicious, and I will make this again in the future. 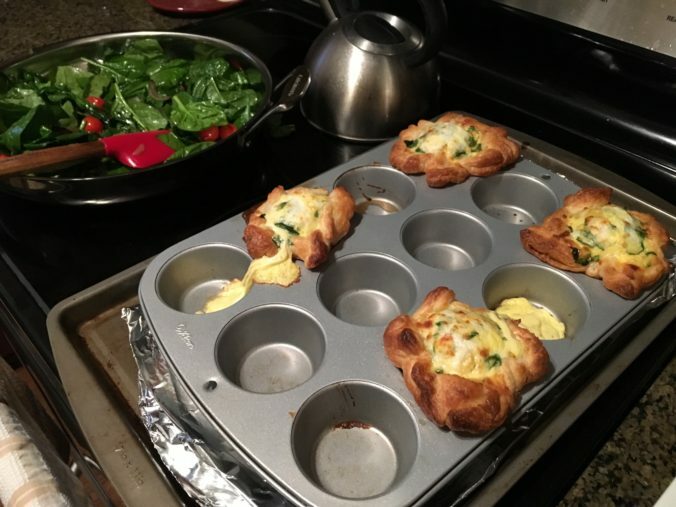 It was low carb and very easy to make. It is a quick weeknight dinner, but it involved ingredients I wouldn’t normally buy at the grocery store, like cannelloni beans. I need to figure out where I could find this in the store. Having it provided in one box was very helpful. 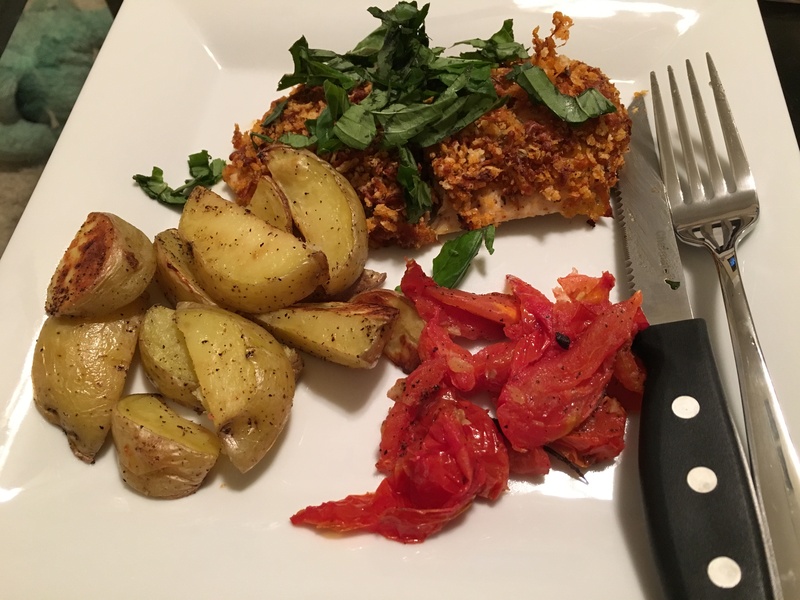 My favorite recipe was the Mozzarella-Crusted Chicken. True confession, I HATE touching meat and it creeps me out to buy it at the store. This recipe was so easy, and I could make it more often to get protein in my diet. It was such a good dinner and took less than an hour to make. This was a fun wander. I had a great time cooking the food and it was relatively effortless. The recipes were easy to follow, even though the they took me longer to make than suggested. I won’t be a regular customer though because of the steep price tag, and it was really annoying that the chicken and shrimp were not included. I may have different opinions once I try other programs. The program concept it great.